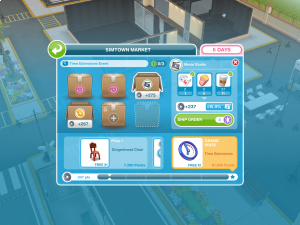 Sophisticated Socialite is the first live Event of 2019 in The Sims Freeplay. The Event runs for 11 days in total, so the sooner you get started the better chance you have in completing the Goals and getting all of the stuff related to this event. Items are unlocked by collecting arts and crafts items using the arts and crafts stations. If you don't have any of these from prior Events and it is your first time with a crafting station, then head over the Event tab to build some crafting stations. You can have a maximum of four, and we recommend that you construct four as soon as possible - A good idea is to dedicate one house just to events such as this one and place all of the crafting stations in it.. If you already have crafting stations, but can't find them, then click the craft station in the Event tab and select the option to find your station, and voila - you'll be whisked off to a house with a craft station in it. The main focus is the craft Items, the best option is always the shortest time period and then to come back and repeat as often as possible... Unless of course you don't intend to come back every two and a half hours... In that case, select the time frame that meets your schedule. You'll also need to allocate time to restock your craft stations, this will happen throughout the Event. Remember you can speed things up with social Points. Once you have collected enough candles, you will unlock the Pottery Station, again if you have these already you can just find them and get going. You can build a maximum of four, and if you intend to get as much done in this Event as possible, then you should probably utilise all four. As you progress further through this Event, other crafting stations become unlocked for you to try to get all the Items.